Q: What is your advice to get better at dancing when you don’t have much time/physical space to practice? Penny: My first advice would be to take classes at ‘foundation’ or ‘beginner’ level. Especially good if they teach a piece of choreography over two weeks as it gives you a chance to practice what you learnt in between classes and improve on what you know. Doesn’t matter what style, even if it’s just one class a week. These classes are usually designed to focus on building some base steps and your overall understanding of how to move your body and how to commit the movement to memory. With each class you will slowly see progress. If you don’t really have the time or funds to go to classes there are a lot of videos on YouTube teaching a HUGE variety of hip hop, jazz, ballet, popping, etc. foundations. Take some time to watch and follow along to these videos in your room. Once you’ve learnt some of these foundations you will feel more confident to pick up variations and more complex choreography. 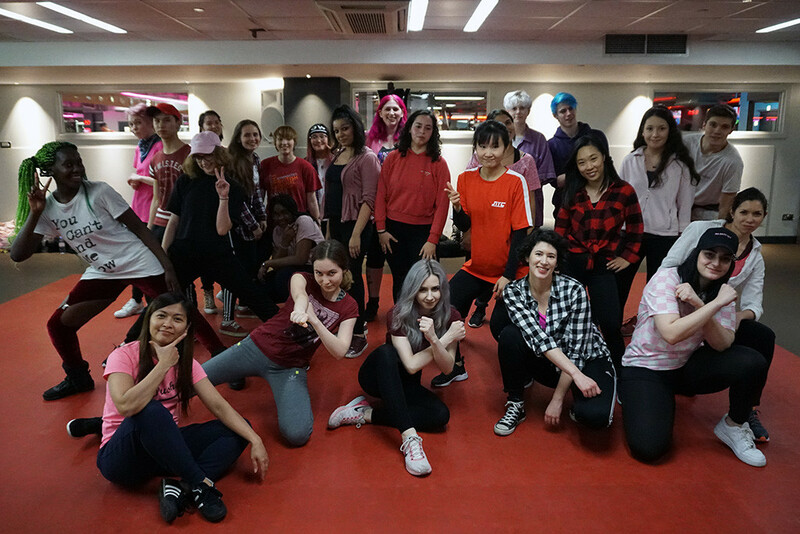 Dickie: I think the average age is around 25-26 however we have dancers ranging from school / college students to university students and from young professionals to K-Pop fans in their 30s, 40s and over. Penny: I would say the average age is 22-25, with some as young as 16 and some 35+. I’m 28 and not the eldest one here! Q: How long did it take for you to become confident with picking up dance routines? Dickie: When I first started going to Pineapple Dance Studios, I really struggled to pick up choreo in one of the hip hop classes. It took me a good few months to be able to pick up dance routines confidently. Like any other skill, it takes practice to learn the skill of picking up choreography. So keep at it! I think it does depend on the style of the dance too. I found that for certain classes I’d be able to pick up choreo quicker than others. Penny: I’ve been lucky enough to have taken dance classes since I was 7 years old so I built my dance foundations and confidence early on. The more classes you take/practice you do the more and more confident you will be in your dance abilities. Everyone’s journey is different so try not compare yourself to others. Only compare yourself to the last time you danced and try and improve on that! Q: If I haven’t been able to attend a Part 1 of a song will I be completely lost if I start learning the song at Part 2? Dickie: No you won’t be. Part 2 is usually a new section of the song, different to Part 1. From Part 3 onwards, sometimes the choreo covers some combos from previous classes. So we do recommend starting from Part 1 or Part 2. However if you’re a bit more experienced and you can pick up choreo quickly or you don’t mind just learning the new bits of the class, then you’ll be fine. Q: How do you guys teach yourselves the dances? Dickie: I use mirrored dance practice videos if they are available and learn from those. Before I dance, I usually would have watched the practice videos a few times (and thinking wow this choreo looks amazing and/or how am I supposed to do that move 😀 ). Then I’d try and dance the routine whilst watching the video. I tend to learn the song section by section and not cover too much in one sitting. After I’ve learnt a section I’d go and do something else and then come back and review what I learnt earlier either later in the day or the next day – which I feel helps to let the choreo sink in. Also slowing down the video and dancing at a slower pace helps me see and pick up the details. Then I’d gradually increase the tempo – working my way back up to full speed and also dancing without watching the video. Penny: I firstly always try and find a nice clear mirrored version without any cuts/edits. Next I watch the dance multiple times just to get a feel for the music and the choreography – sometimes without even getting up, just watching the video, some of the moves have already sunk in. Then I try to follow along with the choreography a few times to see how it all fits together and start familiarising my body with the moves. Then I break the song down into parts (maybe one or two counts of 8 at a time) and just focus on getting that part right (mostly lol) before I move onto the next section. I personally don’t like to slow the track down as it then confuses me when I put it back up to speed. I only slow it down if there is a particularly fast or intricate bit that I can’t catch at normal speed. Once I know the whole dance I then just keep practicing. Eventually getting rid of the video as a reference and relying solely on my memory! It is not a fast process for me! Some songs are easier for me than others, but overall I find it quite difficult and have to give myself plenty of patience and understanding. Q: How long does it take you to learn the dances before they’re taught? Dickie: I usually learn the song in parts – about a 1/4 of the song. On average, it’d take me about 30-60 minutes to learn the overview of one part of the choreo. And another 1-2 hours to learn all the details with counts. However it does depend on the difficulty of the song – for example, BTS – Fake Love took ages, and iKON – Bling Bling was easier. Penny: It takes me about one to two weeks to learn and feel confident in a K-Pop dance I’ve learnt from a video. Q: How to improve flexibility and “swag” factor :-)? Dickie: I would recommend yoga classes for increasing flexibility! Or do lots of stretches regularly. And for “swag” – to watch artists you think have it and try to copy their movements, body language and facial expressions. Really own it. Fake it till you make it! Penny: Flexibility takes time and persistence. I used to be able to do the splits and after only a month of not stretching I couldn’t do them anymore! There are a lot of videos online with stretches and techniques for improving your flexibility, depending on what part of your body you want to become more flexible (back, quads, hamstrings, etc.). I would follow those and most importantly take it slow and be persistent! As for swag, lol I do not have it so if anyone has any tips for me, I’d appreciate it! The only thing I can say is to be confident and own your presence, try different things out in the mirror to see what works for you. Q: When is the next showcase going to happen? How many times does it usually take place? Q: What’s your favourite K-Pop dance? Who is your favourite K-Pop dancer? Penny: I have a lot of favourite dances, but Taemin’s Move is one of my faves because it’s a bit weird and suits my style. Taemin is probably also my favourite K-Pop dancer – he is so talented and dedicated. I feel like he was just born to dance, when you watch him perform he always looks like he’s having the best time. Q: What’s your favourite dance that you have taught so far? / What’s been your favourite song to teach? Dickie: BTS – Fire it was so fun and powerful at the same time. BTS – Not Today, especially when we recreated the human wall and got some dancers to break through it! Q: Which K-Pop group or idol would you want to spend the day with? Penny: I’d like to hang out with MAMAMOO, I think they are funny and really talented! Q: Which MV got you hooked on K-Pop? Dickie: I have good memories of watching Super Junior – Mr Simple, Taeyang – Where U At & EXO – Mama. Mr Simple for the super catchy tune and fun dance, Where U At because of how cool they looked dancing in the alleyway, and Mama for the dramatic intro and the awesome choreo! Penny: Hmm, probably one of Kara’s old MV’s. I don’t really remember because my friend showed me a lot all at once haha! Q: What’s your favourite K-Pop song? Q: Which is your favourite top K-Pop band/song (apart from BTS)??? Q: Hardest routine ever performed? Penny: Cherry Bomb – NCT127! Not really my natural style, is over 4 minutes long, high energy and has a lift in it! Q: Do you like all the songs you teach? Penny: Hmm… I like some more than others. I’ve never taught one I’ve actively disliked. Q: What is the purpose of a rubber duck? Dickie: I heard it’s visited Hong Kong in the past! Penny: Put that one down as one of the great mysteries of life. Penny: IDK?!?! Hopefully before the end of the year! Q: Are the whole song courses held at same day every week? Dickie: For a given day each week, usually we teach the whole song over a number of weeks. E.g. if you attend all classes (Part 1, Part 2, Part 3 & Part 4) on a Tuesday every week that will cover the whole song. Q: Do you have class at 8pm? Dickie: Toughy…. but it’d have to be Jungkook right now. Q: Dickie, who is your bias in Momoland?? Dickie: Hopefully we will be teaching some Monsta X soon. Dickie: Bubble tea! I mainly drink Chinese / Korean teas. Q: Do you offer private classes? Dickie: At the moment we’ve been filming covers of songs we’ve worked on for the dance shows. So it’s been mainly dance show performers who have taken part. If you’re interested in taking part in future dance covers, we recommend you come to classes and audition for some of the dances so you have opportunities to be considered for future dance projects! Q: My sister is 13, but she is an exceptional dancer having attended a multitude of classes at Pineapple Dance, Sylvia Young and Portobello Street Dance and she is a huge K-Pop fan. Is she eligible to attend despite her age? Dickie: The minimum age to take part in our classes is 16. Please ask her to come back in a few years time! If anything changes in the future we’ll announce it through our website and mailing list.